Mr. Penumbra’s 24-Hour Bookstore is an absolute delight from first page to last, one of those rare books that I never had the urge to put down for even a second. It reminds me of two other books that I’ve read this year, Ernest Cline’s Ready Player One and John Scalzi’s Redshirts, in that it has a distinct meta-interest to geeks. Yet it goes well beyond either of those books and offers reading joy to a much wider audience. Unlike those books, it isn’t even science fiction, yet it possesses the same wide-eyed sense of wonder that gives that genre its greatest appeal. Mr. Penumbra’s 24-Hour Bookstore doesn’t really belong to any distinct genre, yet at its heart it’s a kind of puzzle, a book with a secret at its center that needs to be unraveled. Note that I don’t call it a mystery, because it doesn’t belong to any known variation on the mystery genre. In a way it’s a very old-fashioned book, yet at the same time it lies at the cusp between Gen-X and Gen-Y fiction. It’s about dusty old books with fraying bindings, but it’s also about computers, smartphones and Google. Beyond that, here’s all I’m going to tell you about the plot, because this is a book you really ought to discover for yourself: It’s about an out-of-work young graphic designer wandering the streets of San Francisco, unable to find a job in the crashed economy, who sees in the window of a bookstore that most old-fashioned technology for gaining employment: a help wanted sign. He talks to the owner, Mr. Penumbra, and gets hired for the middle-of-the-night shift. 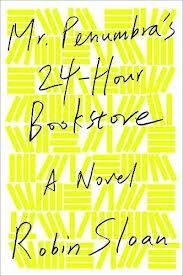 (This is, as the title reminds us, a 24-hour bookstore.) Our hero, Clay, spends most his time with nothing to do, because entire nights pass by without a single customer entering the store. And when they do they are usually older people, identified by cryptic combinations of letters and numbers, who have borrowing rights for books in the rear section of the store, a collection of one-of-a-kind books, many of them quite ancient, also identified by cryptic combinations of letters and numbers, that Clay dubs the Waybacklist, arranged alphabetically on towering shelves mostly accessible from a sliding ladder. Okay, I’m not telling you any more than that, but when Clay’s friends who work for Google and Industrial Light & Magic get involved, the real mystery of the bookstore begins to reveal itself. Although I won’t tell you what it is, I’ll say that the solution to the mystery is nothing like you suspect it will be and is surprisingly touching when revealed. In some ways this is a book about the intersection of old technology and new technology and how they aren’t really as different as we tend to think they are. But it’s also a book about life and human beings and the patterns we all make through time. Finally, it’s a book about a font that’s almost as old as printing itself. And if that doesn’t make you want to read it, I can’t imagine what will. Posted in book reviews, books, bookstores, fonts, Google, Industrial Light & Magic, Mr. Penumbra's 24-Hour Bookstore, printing, reading, Robin Sloan, San Francisco and tagged book reviews, books, bookstores, fonts, Google, Industrial Light & Magic, Mr. Penumbra's 24-Hour Bookstore, prnting, reading, Robin Sloan, San Francisco. Bookmark the permalink.